Winemakers are notorious tinkerers. They love to try different things with different grapes and call them by different names. Adam Mason, winemaker of Mulderbosch in South Africa's Western Cape is certainly among them. Mulderbosch doesn't make a Bordeaux blend, so Adam decided he'd make one himself and call it Marvelous. And so, he did. Mulderbosch was founded in 1989, just after Apartheid ended. South Africa's wines had been indifferently received for many years and had a lot of catching up to do. The winery established itself immediately as the best white wine producer in South Africa. The winery changed hands in 2011 and that's when Adam came to the party. He brought a lot of Napa Valley experience with him and, of course, that means Bordeaux varietals. Marvelous is his venture into red wine. And after tasting this one, we wonder what took him so long. But we're glad he finally made it. Adam teamed up with a chef in South Africa to have input on making wines that compliment food rather than competing with it. He has certainly achieved that here. 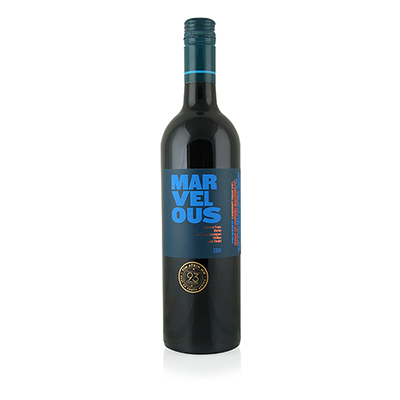 This may be one of the best red wines we've ever tasted from South Africa. The flavors are a balanced, harmonious whole that is greater than the sum of its parts. All the juicy, rich flavors that you would normally associate with the Napa Valley are perfectly held in this wine from half a world away. Everything is there except the price.